Summary: The new novel from the New York Times bestselling author of The Descendants—a hilarious and charming story about a quirky single mom in San Francisco who tiptoes through the minefields of the “Mommy Wars” and manages to find friendship and love. 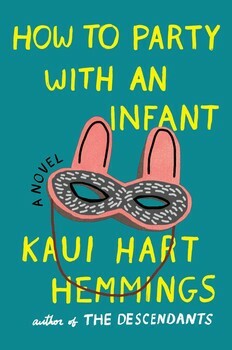 I have to share a funny story that happened when I was reading the new novel HOW TO PARTY WITH AN INFANT by Kaui Hart Hemmings. I was sitting at karate and a mom came up to me and asked me if I was pregnant. I didn't get it for a minute, but I guess she was thinking that I was reading a self-help book. I very quickly assured her that I wasn't having a baby, but I'm sure she could tell immediate because I had a disgusted look on my face! HOW TO PARTY WITH AN INFANT is far from a self-help book. Rather, it's a funny story about a single mom trying to navigate motherhood in the trendy city of San Francisco. The novel is funny and does have some touching moments; however, I can't go so far as to say I loved it. I thought it was just ok.
Mele is a single mom with a two year old daughter named Ellie. The father of her baby told her he was engaged to another women when Mele announced her surprise pregnancy. Now, he wants Ellie to be the flower girl at his wedding, and Mele is less than thrilled since she's not quite over him yet. She can't decide if it would be right for her to attend the wedding! Meanwhile, Mele is looking for something to do. She's busy with being a mom and hanging out with play groups, but she might need a little more. (This is where I think many stay-at-home moms will relate.) She decides to enter the San Francisco Mommy Club's cookbook writing contest. She begins by filling out a questionnaire... in a brutally honest (and often times humorous) way, and then she uses her friends' life stories to create the unique recipes. With the help of her play group (and one very special dad), Mele gets through all of the changes in her life, especially Ellie's dad's wedding. She also realizes some important things about being a mom and what she really wants out of life. HOW TO PARTY WITH AN INFANT is truly an original story. I can't think of anything I've read similar to it. I don't mean that the story is entirely unique, but the way it's presented is pretty darn creative. I'm not sure I'm going to explain this very well, but the basic structure of the book is set up in the form of the questionnaire. Then, Mele's story is also woven in. Where it gets creative is that author also introduces Mele's friends' stories and then uses their stories to inspire original recipes. It's a fresh approach to storytelling, and I definitely appreciated what the author was trying to do. I can't honestly say why the book didn't work for me. Maybe it's because I'm so far past Mele's motherhood stage. I also think that I pretty much have nothing in common with her or her stories. As a result, I couldn't really relate to her all that much. I also didn't really love her like I had hoped. There were times when her insecurity shined through and my heart did go out to her, but then there were other times when I didn't really like her all that much. There were definitely some things I did like about this book though. I did think the author did a good job of capturing some of the feelings of hanging out with a toddler all day and attending play groups. It took awhile before Mele found the ideal playgroup, and her stories of some of the earlier ones were cute. I had to laugh at some of the interactions with the moms (and dads) as well as remember back to those days when I wasn't sure if my daughter or I were going to make it. Success was just making through each day in one piece! I also appreciated that this book was so smart and witty. Even though I didn't love Mele, I found some of her observations on life (and especially motherhood) to be pretty darn funny. There were definitely parts of this novel that were satirical in nature, and I think (for the most part) they worked really well. I also thought there were some touching parts of the story that really cut to the chase about how hard it is to be a mother... especially a single mother. I do think HOW TO PARTY WITH AN INFANT would be a good book club pick for a certain type of group -- probably one made of younger moms. There is a reading guide available with twelve questions along with some ways to enhance your book club experience. Some of the themes you might want to explore include friendship, motherhood, sacrifice, forgiveness, acceptance, new relationships, helicopter parenting, mommy wars, and more. Overall, HOW TO PARTY WITH AN INFANT was a cute read that did touch upon some serious issues. I recommend this novel to moms with infants or anyone looking for a unique (and funny) story. I really like that author but suspect I might be too old for the book.